By Alena Ribeiro Alves Peixoto Medrado, Adjunct Professor; Laura Amélia Santos Sampaio, Graduate student e Tereza Deiró, Adjunct Professor, Universidade Federal da Bahia (UFBA), Salvador, BA, Brazil. Researchers from the Universidade Federal da Bahia and Escola Bahiana de Medicina e Saúde Pública conducted a study to evaluate the impact of protein malnutrition on the healing process in rats. The study was carried out in the breeding room of Nutrition School of Universidade Federal da Bahia, in which the rats were submitted to a diet with different concentrations of proteins. It was observed that the nourished animals presented higher amount of collagen than the malnourished ones and that the morphological pattern of this protein was more organized in the group of nourished animals. Collagen is a very important protein for wound healing, since it is the most abundant in connective tissue and is responsible for the generation of the tensile strength in human tissues. This study confirmed in situ an aspect that, for many times, has been reported in the literature only considering the clinical (visual) characteristics of the wound. Through analysis of skin fragments of these animals, the researchers evaluated the formation of collagen in the wound bed through a quantitative analysis that used software that allowed to measure the amount of collagen over time. In particular, two time periods were selected to verify healing in the experimental groups of nourished vs. malnourished animals. For this analysis a specific staining method was used for the study of collagen. In addition to this protein, other aspects of healing were also evaluated in this study, such as the degree of inflammation, cells proliferation, among others. The study is relevant in the current context, as malnutrition particularly affects thousands of pregnant women, neonates and pre-school children worldwide (FRANÇA, et al., 2009). In Brazil, the northern and northeastern regions present a high prevalence of malnutrition (ASSIS, et al., 2007). The persistence of malnutrition causes a worsening of the patients’ clinical status, a deficiency in wound healing and compromises the immune system. Thus, it can contribute to the prolongation of the hospitalization time and the increase of hospital costs. It also compromises the rehabilitation of the patient and their return to normal activities, reducing the quality of patient’s life (EMERY, 2005). The results of the present study suggest that some stages of the repair process appear to be unaffected by malnutrition, such as the formation of new blood vessels, the presence of edema and inflammatory infiltrate. However, malnutrition led to the rapid resolution of edema and the lower cellular concentration in the inflammatory infiltrate in the proliferative phase of the tissue repair, and to a lower expression of the collagen, characterizing a poor healing in malnourished animals. Figure 1. 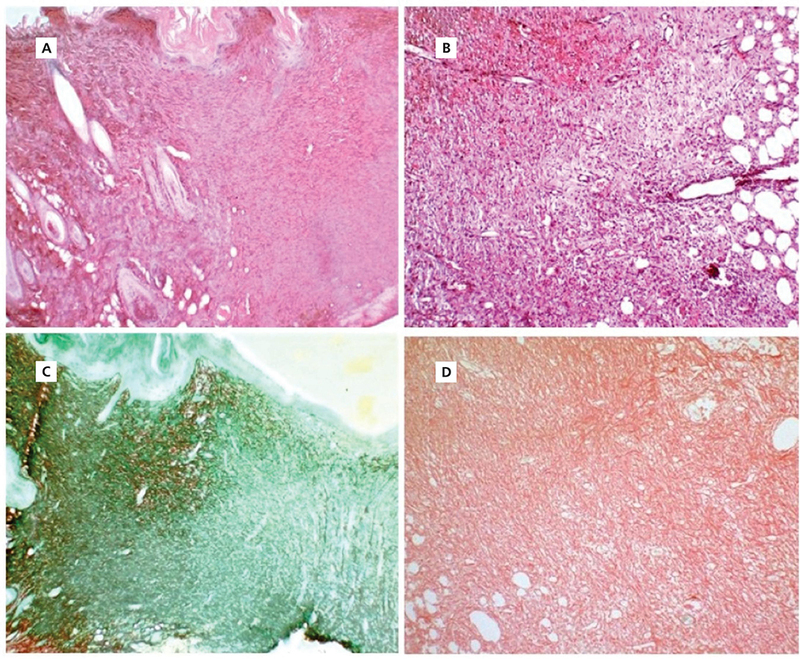 (A) Transitional zone between normal epidermis/dermis and the area of the wound that shows an amorphous stroma and the presence of a discrete infiltrate of inflammatory cells in an undernourished rat, 10 days after surgery and (B) dermis of a nourished animal showing granulation tissue rich in fibroblast cells and blood vessels, 10 days after surgery. Hematoxylin-eosin, 100x. (C) Area of cutaneous injury of a malnourished animal that illustrates low expression of collagen fibers in the dermis, 10 days after surgery and (D) expression of collagen fibers (red) characterizing the process of fibroplasia in a nourished animal, 10 days after surgery. Sirius red, 100x.